Smart cities may have been a buzzword a few years ago, but today they are quickly becoming a reality. Rapid advancements in connectivity, the Internet of Things, and data analysis are driving innovation and powering entirely new applications. From Kansas City to London to Singapore, cities around the world are implementing new technology and transforming the way people live, work, play, and get around. In the US, for example, the average commuter spends about 42 hours a year stuck in traffic, and that number is significantly higher in large cities like Los Angeles or New York. In a smart city, connected traffic lights can analyze traffic patterns and adjust in real-time to reduce congestion and delays. Another application will be to connect utility grids with city infrastructure. Today’s cities consume 70% of the world’s total energy, meaning even minor improvements can dramatically reduce energy usage, pollution, and costs. In other cases, public safety infrastructure can be connected to a centralized monitoring system to respond to emergencies more quickly. And even the more mundane sounding applications can have a big impact on people’s lives. For example, some cities are installing sensors on garbage cans to automatically alert workers when they need to be emptied. So what do all these applications have in common? The answer is that they all depend on wireless networks. Without wireless connectivity, smart cities simply cannot exist. 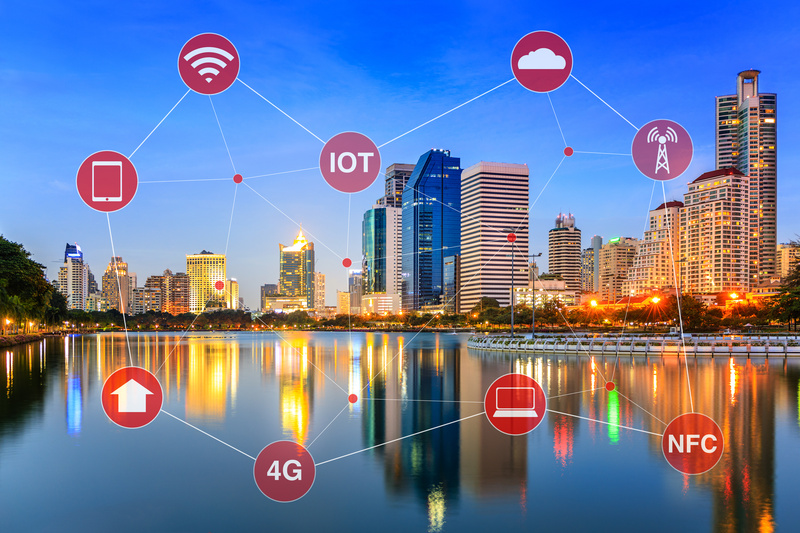 No matter where you are or what you’re trying to achieve, the first step to building any smart city is to implement robust, reliable, and high speed wireless networks. These are the backbone of all of the potential smart city applications. Within cities, various wireless signal types and standards will be used, such as Wi-Fi, 3G/4G/LTE, Bluetooth, NFC, GPS, and others. 5G wireless and other future standards will also be critical to implementing applications that rely on high bandwidth and low latency connections, while dedicated short-range communications (DSRC) may become a key standard for enabling fully autonomous vehicles. With so many different signal types in such a dense and complex environment, establishing reliable connections and avoiding RF interference will be extremely challenging for city planners and engineers. Many of the applications mentioned above depend on real-time data sharing and continuous connectivity, meaning any disruption can cause serious problems. In the case of traffic signals or utility grids, a loss in connectivity could bring the entire city to a standstill. For the same reasons, security will also be a major concern. Many current smart city technologies depend on wireless IP networks which are increasingly vulnerable to hackers. In the US, utility grids have already been attacked, and this vulnerability will increase as more devices and meters are connected. Going forward, security needs to be a vital part of any smart city deployment from the beginning. Finally, capacity and speed will be a major hurdle for smart cities to overcome. The amount of traffic and data that will be transmitted and used will be staggering. The scale of connecting entire cities is something that has not be done before and is not possible given our current wireless technologies. 5G wireless will play an important role in overcoming the barriers by providing high speed and high bandwidth connectivity, but cities will need to come up with unique solutions depending on the applications they are enabling. Smart cities have the potential to reshape how we live, work, play, and commute. But deploying and monitoring smart city infrastructure will require a completely new approach by technology companies, wireless service providers, and governments. These actors will need to work together when designing smart city infrastructure and deploying it in the field. Fully interconnected cities can reduce traffic congestion, improve public safety, increase efficiency, and connect people in ways that can’t yet be imagined. And behind all of these innovative applications and technologies are the wireless networks that power it all and enable the sharing of data and information across systems. When you look at it this way, it’s easy to see how the future of smart cities depends on the wireless spectrum. ThinkRF is the leader in software-defined spectrum analysis to help you monitoring wireless signals in complex environments. To learn more about the equipment that can help you deploy and monitor smart cities, download our recent whitepaper – Seeing the Full Picture: Introducing Software-Defined Spectrum Analysis.